More people are googling for cheap divorce lawyers in Singapore. How do I know? I posted a short article on divorce lawyers earlier this year and am seeing more visitors to that page. 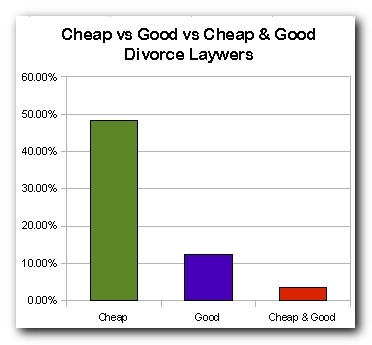 From the Google Analytics results, it is confirmed that more people were looking for cheap divorce lawyers than good divorce lawyers. As I’ve mentioned in my previous article on Divorce Lawyer, it may be less expensive to mend the relationship with couselling to resolve differences and conflicts than to look for a cheap divorce lawyer in Singapore. Kindly advise my mum would like to file divorce with my dad. But one party file can be done? What’s the total process charges? Don’t need maintenance fees and kids is above 30 years old. Only for flat. Need a cheap lawyer for divorce. I want my both my kids to follow me. Pls advise the procedure. I will like to make enquiry on separation procedure and chargers. I am a Singaporean, married on 10 May 2013. We owned a bto hdb. I’m 33 yr old this year. I can’t file for divorce now as I will like to keep this house. I have a stable income and I’m the one paying for the housing loan , renovation loan and household expenses. My husband did not do a part to make any contribution to this house. He is a taxi driver and bankruptcy. He gamble a lot and I had helped him more than 100k over this 5yrs of relationship. It had a lot of loan and outstanding from a few banks. I really hope to put a stop right now on our current relationship status. Pls advice, how to go about the procedure, costing and duration. hi I need a lawyer for my divorce. Both party also agree. No maintenance also. Only house i m taking . I married for 1.5 year and suffered from huge depression from both my husband and his family! I want to devoice with him asap. Need professional help. Please help to recommend me a good and cheap lawyer. Thanks. I need a lawyer for divorce. Kindly advise if I can get a cheap and good lawyer for uncontested case. My cousin few year agos registered with a china lady at spore . After register the girl told need to going back for family visit. End up never coming back to singapore. My auntie was call me assist my cousin settle on this divorce first so that my cousin able marry another person. Can u assist on this? hi my name is coco from china and marry on 2005 to now , i would like to know how the process of the divorce and we both no objection. and how long can get re- marry. I would like to find out the charges for a cheaper lawyer for divorce case as I am currently jobless. I have 3 kids and a maid, and will also like to find out if we want to divorce, is there really a need for separation?